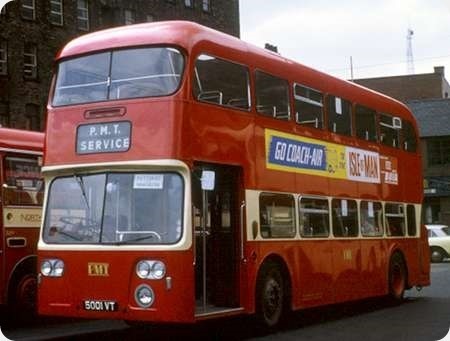 In 1961, London Transport bought a Regent V on behalf of BEA to test the practicality of using double deckers on the service between Cromwell Road Air Terminal and Heathrow. The vehicle had a Park Royal H38/17F body, the restricted seating figure arising from the adaptation of the rear section of the lower deck to serve as a large luggage carrying compartment. The 2D2RA chassis had a 9.6 litre AV590 engine coupled with a Monocontrol gearbox. Proving that the double decker concept was feasible, it wore several liveries as it served with BEA for a number of years alongside RMF1254 and then the RMA fleet with their luggage trailers. It was sold in 1968 to Super Coaches (Upminster) Ltd., one of whose trading names was Upminster & District, and the new owner converted it back into standard bus configuration with windows and 31 seats on the lower deck. It is seen here on the HCVC Brighton Run in 1971, where it seemed to be functioning as a support vehicle rather than as an entrant itself. Surprisingly, there doesn’t seem to be any references to this vehicle after 1971. Super / Upminster & District were rather fond of AECs and ex London vehicles, probably due to their traffic manager, a young man called Peter Newman. In 2019, as chairman of Ensign Bus, his fleet suggests that he is still very fond of AECs and ex London vehicles. I don’t believe that this was taken on the 1971 rally, since by then it had been sold from Super Coaches to City Coaches and on to Ementon, Cranfield. Withdrawn 6/72 after an accident and to Paul Sykes Organisation (dealer), Barnsley 12/72 for scrap. I photographed it with the identical destination setting, including the paper insert, on the 1968 rally as seen in this link. You are right, John. As you suggest, it was the previous year. My mistake. I am not really a bus person (more into coaches) but to me the rather square Park Royal body on 220 CXK looks very similar to the bodies supplied to East Kent also on Regent V chassis, perhaps 220 CXK was tagged onto an EK batch?. I like the coach style wheel discs, Delaine used to have them on their Atlantean d/ds. Photographed in June 1970 at Manchester, and mercifully still retaining its Potteries livery and logo, is Daimler CRG6LX Fleetline No. L 1001, 5001 VT, with Alexander H41/31F bodywork, the first of a batch of twenty five delivered in April 1964. Ten similar vehicles followed in 1965. L 1001 seems to be remarkably coy about showing its destination, reducing its passenger information down to a sticker in the windscreen. Was this route not a standard operation for this type of vehicle, which would not then have had Manchester on its blind display? It should be able to show ‘Manchester’ in the top half of the box (where it reads P.M.T.) and the second line would show X2 in Bold, with Knutsford over Altrincham (where it shows ‘Service’) There are photos on the web of the PD3’s that used to run this service and I have downloaded a copy of Fleetline 964 from the web in exactly the same place showing the full service blind that I refer to.The layover seemed to be quite lengthy and in busy times, the vehicle would have to vacate the stand and park on Lower Mosley Street itself, prior to returning to load up for the return journey. I spent many hours in my spotting days here but sadly I never got to ride on the service, principally as it was an out and back service TO Manchester. These Alexander bodied Fleetlines did not look out of place here as they were look alikes of North Westerns own examples and when PMT provided an NCME bodied Fleetline, of course that resembled LUT’s which used LMS on the Blackpool service, as all had a basic Red/Cream livery. North Western’s Fleetlines had single piece curved windscreens, single headlamps and different sidelights and the NWRCC colour scheme with a lighter red and more cream was much less drab. PMT’s colours on its double decker fleet didn’t exactly brighten up the Potteries’ landscape. The PMT vehicles often parked in Whitworth Street West. This road was close to LMS and was between the two railway lines that ran from the old Central Station and the line from Oxford Road. In my spotting days the low bridge Atlanteans were common fare. The ABC Coach and Bus Guide for the Winter period 1969/1970 contains a timetable for the Potteries to Manchester PMT service X2. Points served were Newcastle-under-Lyme, Hanley, Burslem, Tunstall, Kidsgrove, Lawton Arms, Sandbach, Holmes Chapel and Knutsford. Set downs were at Altrincham, Sale, Stretford and Manchester (Lower Mosley Street). (A full fare table was not shown. The timetable shows ‘dep’ for departure times up to and including Lawton Arms and ‘arr’ for arrival times at Altrincham and beyond. However, Sandbach, Holmes Chapel and Knutsford have neither ‘dep’ or ‘arr’ which may mean they could have been both pick-up and set down points). PMT also ran a Hanley to Birmingham service X1 which had a similar format timetable. Bury also had some Alexander Fleet lines, 117 to 131, later 6317-31, but they had flat windscreens and were the full height version. David Slater’s description of the timetable is very helpful. Was it really the case that passengers were only allowed 30 minutes to spend in the city of Manchester. Barely time to purchase a cup of tea and an Eccles Cake! In 1940, with Britain at war and civilian air traffic barely existent, Croydon based Imperial Airways formally subsumed the privately owned (though nationally subsidised) British Airways at Heston and became BOAC, though this had been the de facto situation since September 1939. At the end of the war, with Heathrow becoming the major UK airport, the European air passenger traffic business was separated from BOAC in 1946 and named BEA. (British South American Airways, a short lived separate company formed at the same time for the South American air services, was reabsorbed into BOAC in 1949 after the disappearance of two Avro Tudor aircraft over the Atlantic.) 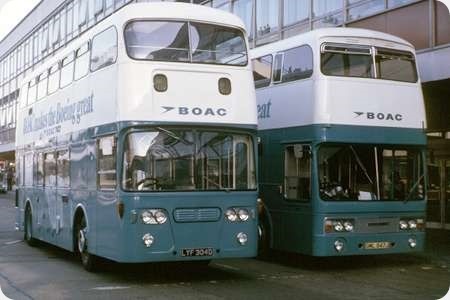 To fulfil the road transport requirements between London and the developing Heathrow Airport, the Ministry of Supply allocated BEA and BOAC a number of Commer Q4 Commando 1½ deck observation coaches with Park Royal 20 seat bodywork that had 180 cubic ft of luggage space under the raised rear section. BOAC, operating from the former Imperial Airways building at Victoria, stayed with Commer for its replacement passenger road fleet and took Harrington bodied examples of the early petrol engined Avenger model between 1949 and 1952, though a solitary Harrington C37C bodied Leyland Royal Tiger PSU1/13 came in 1950. The TS3 two stroke powered Harrington Contender then became the favoured choice, and BOAC became the Contender’s best customer taking a total of 28, of which 19 were employed in overseas locations. (Strangely, the Harrington Contender does not appear at all on BLOTW.) The last BOAC Contenders (the figure varies between one and three) reputedly had the Rolls Royce petrol engine (again, sources vary as to whether this was the straight eight B80 or the six cylinder B60) married to a torque converter, a power train concept surely inspired by a variant of the Dennis fire engine. One wonders, however, how this layout could have been accommodated like the flat TS3 engine under the floor of the Contender. As air travel became more popular, both BEA and BOAC turned to the double decker for the airport links. 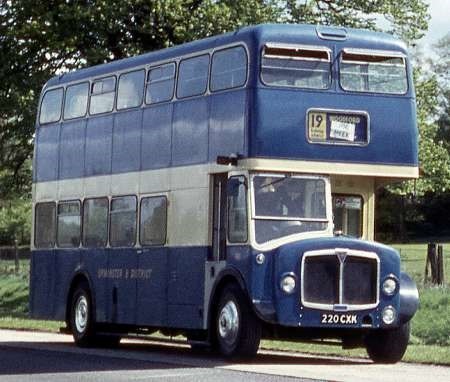 BEA, whose road operations were overseen by London Transport, took the Routemaster, but BOAC preferred the Leyland Atlantean PDR1/1, purchasing fifteen in 1966, LYF 304D to LYF 318D inclusive, with “Alexander clone” MCW bodies that seated 38 passengers upstairs and 16 downstairs; the vacated space was used for luggage. Later, in 1971, these were supplemented by six PDR2/1, GML 846J to GML 851J inclusive, with Roe CH41/24F bodies. It is thought that all these Atlanteans were operated on behalf of BOAC by Halls Bros. at Hounslow. The picture shows examples of each type at the Victoria terminal building. PDR1/1 LYF 304D was delivered in October 1966, and PDR2/1 GML 847J arrived in July 1971. The BEA and BOAC London – Heathrow road services were taken over by the new British Airways from 1974 and had ceased by 1980, by which time air passengers had become accustomed to booking in directly at Heathrow, and the central London passenger facilities had become superfluous. One of the MCW bodied vehicles, LYF 307D, has been preserved. I remember riding in these Atlanteans out from Victoria to Heathrow. The BOAC departure point was the ground floor of their headquarters, which faces Victoria coach station across the road, although given the clientele of both BOAC and long distance coach at the time probably very few transferred between the two. There have been many memories posted on the web about the buses out to Heathrow, a significant number of which seem to mix up BEA, BOAC and British Airways, the separate London departure points (BEA moved round several time over the years), and the vehicles, inevitably sometimes calling this BOAC fleet "Routemasters". After the merger of the two airlines, although the two bus fleets were painted in a common livery, separate operations were retained, from the different London points to the different Heathrow terminals the two halves of the airline continued to use. Did Halls actually run the BOAC fleet ? A poster elsewhere on the web says they were employed by BOAC and drove them as part of their other airport driving duties. The vehicle base was in airport property on the north side of Heathrow, where the car parks are now. I saw the preserved Atlantean had been used in a nice British Airways TV ad with a historic theme a few hears ago. Halls did own another Atlantean fleet, Roe bodied, for US airline TWA, likewise in their colours, used from their Piccadilly terminal, and also for other independent hires, they could be seen at various points around London. Pan Am also had their own road connections, with coaches, from a point in Kensington. That was the last type of d/d bus I rode in at the start of my journey in May 1971 to Australia where I still reside. The operation of a bus fleet necessitates facilities for cleaning, washing, fuelling and maintenance. It is possible, perhaps, that the driving staff were BOAC employees, but did the airline really cover all the other essential requirements itself? It is surely more likely that a specialist contractor like Halls would have been used. An airline at its main base typically has a very large fleet of motor vehicles of all types, specialist and standard, and a Motor Transport maintenance department to suit. These would operate both airside and on the road. I would imagine the BOAC motor fleet of all types required at Heathrow would dwarf the Hall fleet, the numbers possibly into the hundreds, all of which would require the services described. Further buses were commonly owned for passenger transfer across the apron. BOAC used to have some substantial articulated passenger trailers at Heathrow pulled by HGV tractor units which shuttled between the terminal and the aircraft. They lasted well into British Airways days. These were an interesting niche about which there is little information. I don’t see why BOAC who had a large fleet of lorries and other vehicles as well as buses, would need a coach hire company to maintain their buses at Heathrow when they were perfectly capable of looking after their own buses at Prestwick. These services must have had a road service licence, probably the old Express Licence, as they just charged fares, sold at a terminal counter, and anyone could go on them, not just air passengers. 7 shillings and 6 pence (7/6) seems to ring a bell. I don’t recall there being a published timetable (otherwise I would have taken one) but they were fairly turn up and go. Both BOAC and successor British Airways also ran substantial fleets of regular coaches at Heathrow, Leopards and others, run both airside and landside, for trips such as shuttles to hotels, and I recall these coaches sometimes turned up on the BOAC Central London run as well. I presume the two fleets were kept separate so those used only within the airport could run on red diesel. These were certainly operated by BOAC as I worked in the PSV section of the Metropolitan Traffic Area and, unusually, rather than use the post, on occasion a smartly uniformed BOAC employee would turn up with a batch of renewal forms. I seem to recall that the vehicle licences would have been stage, but I don’t doubt that the road service licences would have been express. I wonder if airside lorries and coaches would have run on red diesel within the airport boundaries as ‘red diesel’ wasn’t available until later, and in any case, there was a lot of domestic air traffic.’Red diesel’ is for agricultural use. Red diesel is for use by anything that does not run on a public road. Boats, trains, off-road industrial and construction vehicles and plant are allowed to use red diesel as well as agricultural use. Linking in with Philip’s comments, West Yorkshire used red Diesel when running in overhauled engines on the two Heenan & Froude dynamometers in the engine test house at Central Works. A small brick building behind the test house housed a largish fuel tank marked ‘gas oil’ specifically for the red Diesel. The units would probably have been classed as stationary engines whilst on test. Although I realise Roger’s posting is mainly regarding Leyland Atlanteans, perhaps I may be permitted a few words of clarification regarding the Harrington Contenders used by BOAC. Most of the Contenders were petrol powered using the Rootes "sloper" engine as featured in the contemporary Avenger chassis. In fact a number of the BOAC Contenders were in service two years before the TS3 diesel was announced. If the chassis codes are to be believed then only 6 of the fleet were TS3 powered and all of these were exported – as were many of the petrol versions. The petrol engines were front mounted but it seems likely that the TS3 versions were mid mounted in the same way as the coaches that were available for general purchase. The Rolls Royce Contenders were also mid-engine. Modifications were made to the intake system of the down draft carburettors to reduce height and a fabricated sump was made to allow the engine to sit lower in the frame. Two were built, both with B60 engines. Thanks for that clarification on the BOAC Contenders, Nick. Yours is the first definitive explanation concerning these remarkable vehicles that I have encountered. One can understand the preference for petrol engines in overseas locations, but why persist with them at home? Again, do we know where the Rolls Royce powered coaches were based, and why such idiosyncratic power trains were felt to be necessary? The expense of so adapting a mere two vehicles could not possibly have been cost effective. I made an embarrassing error in my previous post – there were in fact three B60 Rolls Royce Contenders for BOAC, not two as stated. They were JSD 851, KAG 783 and LCS 638, delivered in 1956, 57 and 58 respectively. All went to Prestwick airport, at that time an important hub in trans-Atlantic flight. There they stayed until individually returned to London during 1964-65. After a few months, LCS 638, the first to return was sent out for further use in Karachi. It is known that at least one Commer based coach was also in use there but whether this replaced or supplemented is not known. Never heard of again of course. The other two saw only months of service (or perhaps just stored) before they were disposed via dealer Four Point Garages, Feltham to A. C. Pond Coaches of Roydon. Both were scrapped before the end of three years. They were incidentally, together with an unknown number of the Commers, six inches narrower than the standard 8 ft. coach. I was fortunate enough to obtain drawings from Kirkstall axles, Leeds before they closed down. In considering the logic of such vehicles, one has to remember that in the 1950s air travel was promoted in rivalry to travel by Luxury Liner and the then necessary coach transfer was no time to let the side down. Furthermore, although diesels reigned supreme in the service bus, many coach operators for private hire insisted on smooth petrol vehicles even after rationing, rising prices and supply problems resulting from the 1956 Suez crisis. For Harrington, even selling as they did to the "top" end of the market, the reason for using a Rolls Royce engine is slightly more prosaic: there was probably a sale on. In the mid 50s Rolls Royce were attempting to increase sales their "B" range of engines and made them available to a wider market. For Harrington this was a last determined attempt to make the various versions of the Contender attractive to all levels of their customers. It is generally considered that Suez killed the Rolls Royce Contender. Indeed, by 1958 the whole integral coach project was scrapped in favour of a new lightweight body later known as the Crusader which was intended to suit the most popular chassis of the day.